African Black Soap has long been used, beginning from the tribal communities of Yoruba found in Nigeria. It has since been passed down to succeeding generations, and other regions in West Africa. It is traditionally known as ose dudu, to which it translates as “Black Soap”. In Ghana, black soap is referred to as alata samina which means “The Pepper’s Trade Soap”. The Yoruba tribe was said to have participated in business with the Ghanaians. Most of these were women who traded peppers and tomatoes. They were known as the Alatas or Pepper Sellers, thus the origin of the name. Why is African Black Soap So Effective? 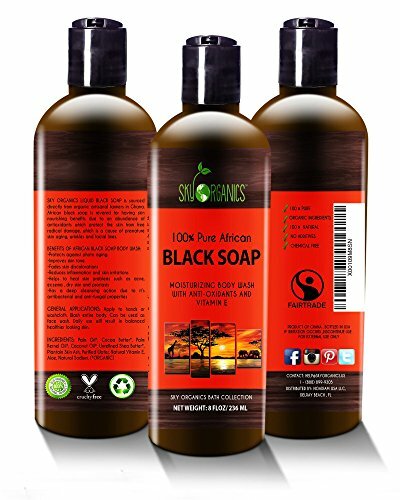 Is African Black Soap naturally unscented? How long before this type of soap expires? Can African Black Soap irritate the skin? As it is a naturally-made and homegrown product, African black soap has been said to provide benefits and healing properties that can even help skin conditions. Of course, black soap has varying additional components depending on the manufacturer. But the main ingredients are abundant with antioxidants. The soap is mainly made out of sun-dried plant matter that could be obtained from cocoa pods, Shea tree bark, or plantain skin. Plus, it has oils and fats added to it, as well such as coconut oil or Shea butter for better nourishing effects. It’s a good thing that this soap is organic as any other plant-based soap. It helps maintain the pH balance and production of oil in the skin so it’s okay to use whether you have combination or oily skin. Variants of this soap are also usually unscented and are safe for dry and sensitive skin. You just need to double check the label if it says it’s unscented. This soap has natural exfoliating properties because of the caffeine in the cocoa pods. Also, this type of soap has the highest content of Shea butter. It helps protect the skin from further discoloration, and any damage due to exposure to the sun because of its UV protection. It can even be used in clearing brown spots, too. Because of this property, it can help even out your skin tone as well leaving a radiant glow to your skin. Having dry or sensitive skin can make you wary of irritating it with any products, especially when using soap for your body. Good thing that this soap has a soothing effect to the touch that you wouldn’t need to worry about having any red patches after bathing. Not only that, cocoa and coconut oil have a lot to contribute to the skin’s moisture. These work so well together that customers say it soothes itchiness and mild rashes caused by eczema or skin allergies. The African palm tree is also a common ingredient used to make this type of soap. It contains palm kernel oil that has a great amount of lauric acid that cleanses off unwanted remnants on your skin. It exhibits antifungal and antibacterial properties that will make you feel clean as can be. African black soap also contains palm oil that is rich in antioxidants that help treat acne and skin conditions such as psoriasis. It also increases protection for your skin cells against environmental pollution with the help of Vitamin E.
It can also fight acne. By balancing your skin’s natural oils, it gets rid of pimples and acne. Even great damage caused by the Propionibacterium acnes bacteria can be fixed thanks to the antimicrobial properties. The shea content also works in replacing damaged cells. Coconut oil and shea butter together work together in reducing the amount of collagen lost, and encourages the formation of new collagen. As a result, you get fewer wrinkles and fine lines. Because of the rough texture of the soap, it also works as a dead skin exfoliation agent. Shea butter is rich in antioxidants, and also helps fight photoaging. Sun exposure causes sun spots and age spots, but African black soap forms a protective barrier for the skin. Because of all the natural ingredients in African black soap, its benefits are abundant. However, the roughness of the soap’s form is a great factor as well. Unless it’s commercially processed, the raw ingredients in the rough soap makes it rough in texture, creating a natural exfoliant that improves skin texture. As mentioned, the exfoliation is a big part of the African black soap use. Because of this, it’s great for shaving, waxing, and hair removal in general. It removes dead skin cells – making it sure that your hair follicles aren’t clogged. The moisture it provides also inhibits the formation of bumps and lumps that come from razor burns. Sun damage and acne scarring cause hyperpigmentation, which can be soothed and prevented by this soap. Because of the Vitamin E and shea butter found in the soap, it reduces redness and appearance of stretch marks, as well as other forms of scars. The itchiness that comes with stretch marks is also relieved. So you might be thinking – all of this is amazing. But where are these benefits coming from? The answer lies in the raw, natural ingredients that make up the soap. These include cocoa pods, palm tree leaf derivatives (palm oil and palm kernel oil), coconut oil, shea butter, and plantain butter (which is rich in vitamins A and E, and iron). The exact composition of the soap recipe varies depending on which region of Africa it is made from. Plantains, for instance, are abundant in Western and Central Africa, but not in Eastern Africa. Some variants also have added ingredients, such as essential oils like eucalyptus. This creates a relaxing effect. Others enrich it with aloe vera and oatmeal. As mentioned earlier, the authentic African black soap comes in an unprocessed and raw form. The rough texture is necessary to achieve maximum dead skin cell removal and skin exfoliation. If you want to use it as a regular cleanser, you’ll need to smoothen it out. To do this, simply rub it in between your hands. Liquid cleanser may be preferred by other users, which you can create on your own. Simply dissolve a soap piece in water. Directly using the soap on your skin is great for exfoliation. Because it’s naturally rough, you don’t need to aggressively rub it. Be gentle. Others place the soap inside a thin washcloth for more gentle cleansing – especially on areas of the skin with injuries or rashes. Whichever of these methods you prefer, make sure to rinse the soap off completely with lukewarm water. After washing, apply a moisturizer of your choice to help seal in the natural hydrating effects of the soap. African Black Soap is so popular in skincare that it has been altered into various products. There is a variant of it where raw soap is placed inside a container without any shape. Some manufacturers say that African Black Soap is in its rawest form when it can’t hold its shape. It also has a variety as a shampoo that offers deep cleansing properties for the hair that removes the dirt and particles – all the while keeps the moisture locked in. A body gel variant also exists, which is safe and gentle enough on the skin. It creates a nice lather and leaves a supple radiant glow. Another product is the body lotion that is good for soothing the skin. It calms redness and leaves the skin hydrated. Of course, the most common is the soap bar form, which is widely available compared to the other forms. 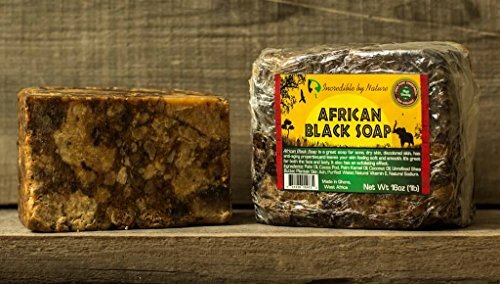 Here we collected some of the best African Black Soaps that you can find on Amazon, together with a brief look at the company that manufactures them so you can make an informed choice before buying. SheaMoisture is a company that produces natural and organic products. Each product is made with the body in mind. They practice fair trade here and in other countries. 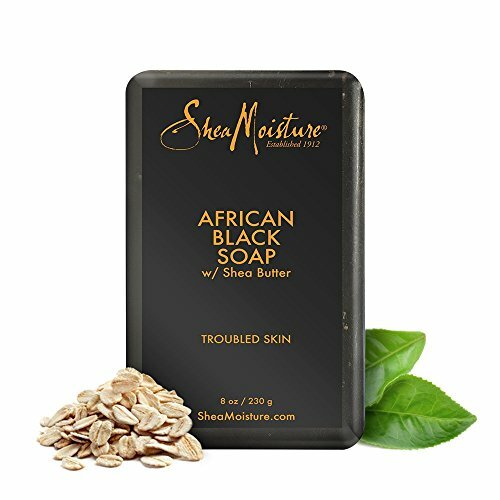 SheaMoisture African Black Soap Bar Soap –They try to create products with zero sulfates, parabens, and other harmful chemicals. All testing was made on their family and not on animals. Incredible By Nature creates high-quality products that are also cost-effective. 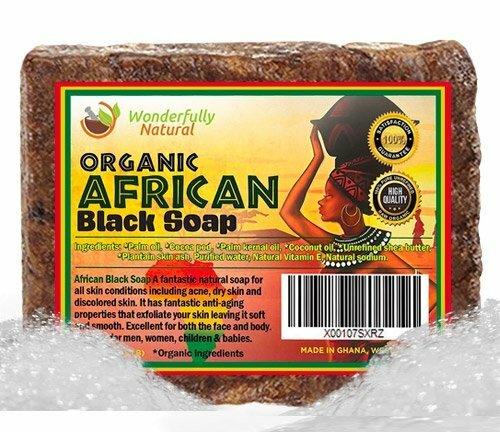 After launching their flagship product, the Incredible By Nature African Black Soap, they realized the importance of making their lines available to everyone. This soap has shea butter, cocoa pods, cocoa butter, antioxidants, anti-inflammatory properties, palm oil, vitamin E, palm kernel oil, lauric acid, and coconut oil, which are all raw and natural ingredients. Our Earth’s Secrets is a brand that believes in creating high quality natural products. All of their items are created using ingredients they sourced directly from farmers and producers, making sure that the quality is authentic and their practices are environmentally friendly. 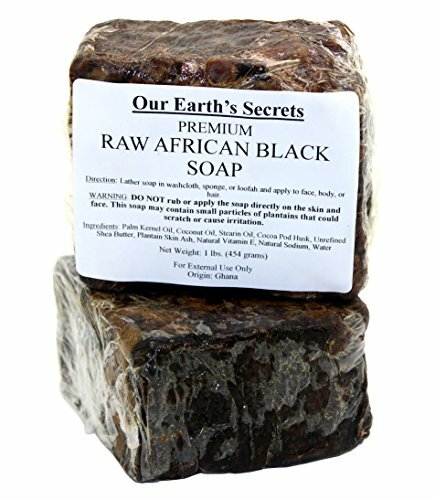 Our Earth’s Secrets Raw African Black Soap uses sustainable ingredients. No harmful chemicals are used. This company aims to provide healthy and natural products for all families. Because they were not happy with the existing choices in the market, the founder Sara Jade took it upon herself to create her own line of simple and organic products. The Sky Organics African Black Soap is one of their most popular and beloved products. Wonderfully Natural is an African-owned company that practices fair trade. All purchases are aimed towards helping Ghana communities, where the soap is made. This ensures partnerships are strengthened and the proper aid is given to the homeless and disabled people in Ghana. Everyone benefits from their products, including their flagship item, the Wonderfully Natural African Black Soap. This also made our list of recommended shampoo bars since it works well on hair also. Depending on the process and manufacturer of African Black Soap, it naturally has no scent but a faint whiff of earthy or chocolate fragrance. Some places in Nigeria that produce it, however, have a kind of smoky smell that comes off as pleasurable to other consumers. African black soap does not expire or go bad. However, it also depends mainly on the maintenance of the soap. Because of its naturally crumbly form, some parts that have ashy or drying portions should be wet slightly to keep it moldable and usable. It is also ideal to keep it only slightly wet so it does not melt into liquid waste. You can also check out more ways to maintain it here. Since this type of soap has natural cleansing and exfoliating properties, it actually is ideal for sensitive or drying skin as long as you remember not to scrub too hard. It does not have artificial ingredients, thus it has little to no harsh chemicals in the process of making it. You can even use it to wash your face, as long as you moderately use it by applying less product than what you use on your body. What makes African Black soap one of the most effective organic soaps is the natural ingredients that it packs. If you’re looking for a way to lighten your skin, even out skin discoloration, heal acne, or soothe any skin allergies, then you can definitely give this soap a try. You might never know how great it works unless you do. Be sure to check out our other soap articles to learn more about French soaps, Japanese soaps, Italian soaps, Moroccan soaps, and soaps from all over the world.